Kate Hamill is once again the toast of off-Broadway thanks to her acclaimed, creative, and incredible adaptation of Pride and Prejudice running at the Cherry Lane Theatre through January 6. 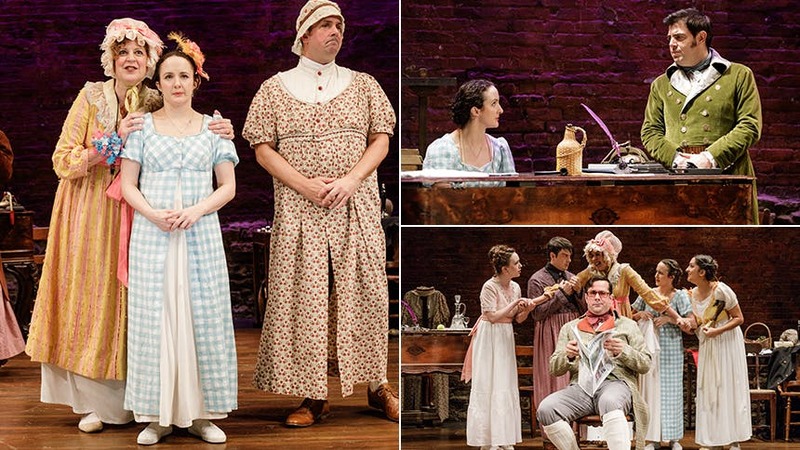 In addition to adapting the popular Jane Austen novel into a romantic farce, Kate stars as Elizabeth Bennet in the Primary Stages & Hudson Valley Shakespeare Festival co-production. Her previous works include her award-winning Sense & Sensibility with Bedlam Theatre Company and Vanity Fair. BroadwayBox caught up with Kate to discuss her process, the enduring power of Austen's themes, and advice she has for aspiring playwrights. 1. How do you begin your process? When does tone take shape? How does music come in? I’m a big believer that every play teaches you to write itself. I really approach adaptations as new plays that I’m co-writing with someone who is currently dead. So, I start out by rereading the source material a bunch of times and I figure out how it strikes me or what my point of view on it is. Then I let that shape everything else. For instance, in Pride and Prejudice, it really became to me a play about “how do you know if you met the right person?” The one we would say now. I was really interested in different kinds of matches. Then I started thinking about how we deal with that in life and how we tend to treat romantic love like it’s a mix between a game and war. There are rules—there is a book called The Rules. Games are things that serious and high stakes but at their hearts sort of nonsensical and ridiculous—and for me that’s very much what love and courtship are. Then I started thinking of a play structure that builds games into the play. Then I thought how can I make the play like a game itself and that’s where I thought of farce—it has high structure and a lot of nonsense and high emotion. Love is like farce—it’s crazy and it can be quite funny and highly dramatic. I started thinking about when you meet someone and you fall in love or something happens that changes your life beyond your control, and I wanted a way to make that more tangible. So, I thought bells are things you can’t ignore—church bells, wedding bells, alarm bells, door bells—they let us know something has changed, and I wanted to incorporate those in the script. So, every time something happens beyond the character’s control, something happens with a bell. 2. If you could interview Jane Austen, what would you ask her? I would be interested how she kept the faith in what she was doing. She wrote in a time where she didn’t know if any of it would get published. In fact, they were never published under her name when she was alive. So, how did you have the faith to keep doing this if you didn’t know anyone would ever read it or see it? I think that’s so inspiring. 3. What advice would you give other female playwrights who see your work and feel inspired to create their own? I would say don’t try to chase the zeitgeist. Don’t try to do something that you think is following what’s trendy in theatre or an imitation of something. Try to do what interests you because if something interests and engages you passionately, it will be much more interesting. Don’t create something just because it’s producible or has commercial potential because, the truth is, it’s hard for that stuff to be anything but hallow. You should learn from other people and see as much as you can and read as much as you can but you should really try to do what interests yourself and is true to yourself. When I was writing Sense and Sensibility (my first play) people sort of treated it like a cute hobby, like stamp collecting. Everyone was like, “That’s not a thing.” Everyone thought I was crazy, but it interested me and I pursued it and I’m glad I did. 4. It's always striking seeing your work how current these stories feel. In your opinion, why does Austen feel so wildly current for today’s social and political environment? Austen is writing a lot about people, especially women, who are really confined by the expectation of their class in a very rigid class system and their gender roles in a really rigid gender role system. I think we are dealing with a time where people are really struggling with that currently. There’s so much economic disparity and so much pressure to conform to gender roles. But now we realize those roles are confining for people and there are a lot of sacrifices you make to fit into those roles. Then when you step outside of those roles, society makes you pay a cost. I’m explicitly a feminist playwright, and I’m interested in gender roles. I wrote a lot of the roles [in Pride and Prejudice] to be gender neutral. In other productions going up in 2018, those people will not necessarily be the gender they are in the original production. Austen’s work is also a lot about hypocrisy and hypocrisy is evergreen—that thing will never go out of style. 5. Let’s talk about what’s next. You're set to star in an upcoming adaptation of Cyrano. What about Austen adaptations? Are you working through chronologically? Yes, I’m playing Roxanne in Cyrano. It’s a totally new script by my partner Jason O'Connell and Brenda Wither, and it’s really wonderful and funny and heartbreaking. I am working through [Austen] chronologically so Northanger Abbey is next, and I started it, but Northanger Abbey is actually going to be a musical; so it’s going to take a little bit longer. Which is funny because eerily it parallels what happened to Austen. She sent Mansfield Park over to a publisher and they held it for a number of years. So, in a creepy parallel it’s coming out but it’s going to take a little longer. I can say Mansfield Park is in development actively for next year. It’s a very different one tonally from Pride and Prejudice. It’s a sweeter story in a sense. Don't miss Kate Hamill in 'Pride and Prejudice' at downtown's Cherry Lane Theatre through January 6. Broadway Unplugged: The Phantom of the Opera Anniversary Stars Rodney Ingram & Ali Ewoldt Perform a Sweet, Romantic, Acoustic "All I Ask of You"